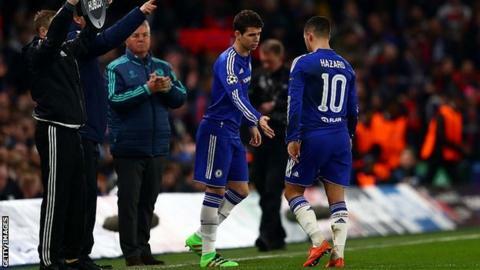 Chelsea midfielder Eden Hazard is in a "dark" place, according to interim manager Guus Hiddink. Hazard, 25, was named PFA Players' Player of the Year as Chelsea won the Premier League last term but is yet to score a league goal this season. "Last year everything was beautiful and this year everything is, for him, dark. The contrast is huge," said Hiddink. "He was the number one and now he's at the end of a long row of players. That's difficult. What do you do?" Belgium international Hazard, who has four years left on his contract at Stamford Bridge but has been strongly linked with a move away from the club, will miss Saturday's home game against Manchester City through injury. "The next period will be very interesting for him," added Hiddink. "Not now, just this season, but also the Euros and the upcoming season. "If he is planning (to move) in his career, then he must show it where he is playing now and in the near future. "I hope he uses his quality in a way that he doesn't think too much ahead or back." Italy manager Antonio Conte will take charge of Chelsea after this summer's European Championship, but Hiddink warned the incoming boss to expect an "even more competitive" Premier League next season. The Blues, the defending champions, lie 10th in the top flight with six games remaining, 13 points behind the top four. And Hiddink, who won the FA Cup with Chelsea in 2009, also said the run-in feels "a little bit empty" with no silverware to play for. "There are no guarantees whatsoever," said Hiddink, 69. "The clubs will have more money to spend next year, which means the league will be even more competitive, which is very nice for everyone, except for those who have been used to being at the top for many years. "We're used to fighting for something and nothing is at stake at this moment. That's strange."